We proudly celebrate our 50th anniversary this year. The 2019 Trolleyday programme is full of special days to mark this achievement as we put together plans to develop and improve our Museum and what we offer you, our visitors. The Trolleybus Museum is open on specified days only (Trolleydays) between April and November each year with a varied programme of themes and attractions arranged for these open days. To help plan your visit, you can download our 2019 Trolleydays Guide (PDF file) or click on the highlighted dates in the calendar below for specific details of what is scheduled (including public transport arrangements) for any particular day. You can also download our 2019 Free Bus Service timetable (PDF file) that contains the timings of all our free bus services except those additional services planned for the Isle of Axholme Running Day & Rally on Sunday, 20 October 2019. Directions to the Trolleybus Museum can be found here. Click here for general information about the Trolleybus Museum. Planning for Sandtoft Gathering 2019 (on Sunday, 28 July 2019) is well in hand. If you would like to bring a historic vehicle to exhibit on 'Gathering Day, you will shortly be able to download an entry form, so watch this page for when it becomes available. Likewise, if you would like to bring a sales stand, you will be able to book and purchase a plot online – watch this space! 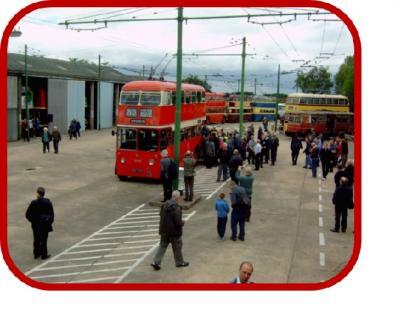 If you would like any additional information about the Trolleybus Museum or any open day, please contact us. We are always pleased to welcome group and private party visits as well as hosting coach trips during our normal open days. Click here for further information. Details of what is planned for the different Trolleydays in 2019 may be added to or amended as time goes on - please remember to REFRESH this page when you revisit it to ensure you are seeing the latest information. Late Summer Bank Holiday Weekend, 24-26 August 2019 - We are celebrating our 50th Anniversary over this August Bank Holiday weekend, 50 years to the day that the original part of the site was purchased and plan to do it in style! As well as having them on display, we are planning to run as many of our trolleybuses as possible.